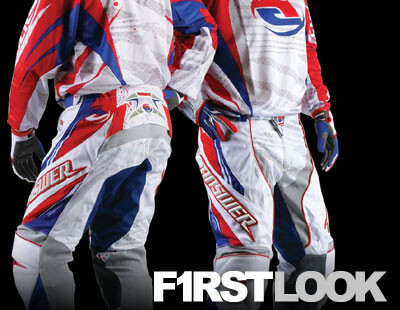 Click the following link for a video overview of the 2008 Answer Racing apparel lineup. Who wants a guided tour of the '08 Answer Racing motocross apparel line with your master of ceremonies, Answer's Big E? Click the link above to check out the Alpha F-10, Alpha Air, Rockstar Ion, Ion, Synchron, Mode and Women's apparel. Damn, that's a lot of gear. If that's not enough to satisfy your thirst for gear, you can always check out the Answer web site at www.answerracing.com.